Let’s Dance Program is perfect for communities with mixed groups, dementia, people in wheelchairs, elderly at all stages, and other groups with special needs. 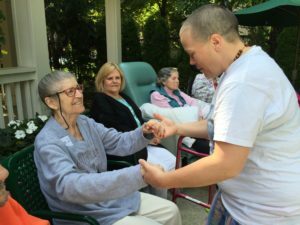 Let’s Dance includes stories, music and guided movement. This program can include all cognition levels and is adjusted based on the groups abilities. Let’s Dance strives to celebrate what groups CAN DO! This program is perfect for the groups that are looking for something different and uplifting. This program is perfect for ASSISTED LIVING and INDEPENDENT LIVING as well as Senior Centers and other groups of adults and families. This program can be adjusted to include fiction or non fiction stories depending on the audience. Dancing around the world in your CHAIR! This dance program is intended for communities that can easily follow directions and have the desire for exercise programs. This includes music & stories but also each story goes into a song that encourages participants to dance in their chair. The program typically includes Irish Step Dancing, Hawaiian Hula dances, and a New Orleans Free Style – ALL IN OUR CHAIRS! Independent walkers are encouraged to stand and dance with Hollis.